The physicians at North Shore Pain Management are now performing two new procedures that can provide relief of the symptoms of lumbar spinal stenosis, without the need for extensive surgery. If you have lumbar spinal stenosis, you may be a candidate for a Minimally Invasive Lumbar Decompression (mild®) procedure, or for implantation of the Superion® Indirect Decompression System. Lumbar Spinal Stenosis is a general term for any condition in the low back where the nerves of the spinal cord are compressed by a narrowing of the openings in the bones of the spinal column. There are a number of ways that the openings can become narrowed, and the exact cause and location of the narrowing can determine the symptoms and the possible treatments. Lumbar spinal stenosis can cause pain with walking or standing that subsides with sitting or lying down, and difficulty standing up straight because of pain in the low back or legs. In an earlier blog post, we looked at epidural steroid injections, which is another treatment useful for LSS. In that article, I described the bones of the spine as almost like closed padlocks that are laid flat and stacked up on each other. The nerves of the spinal cord run through the tunnel created by the stacked-up loops of the padlocks. Now imagine that there is also a ribbon running through the inside of that tunnel that helps to keep the bones lined up and connected. In the spine, this ribbon is called the ligamentum flavum. In certain types of spinal stenosis, the ribbon-like ligamentum flavum becomes overgrown and thickened at one or more levels of the spine, causing central stenosis, or narrowing of the central canal of the spinal column (the tunnel created by the stacked-up padlock loops). In the mild® procedure, using special tools, and a special imaging system, the physician removes the overgrown part of the ligamentum, along with a tiny amount of bone. This restores the space in the central canal, allowing the nerves to function more normally, and reducing pain. This is done through a couple of tiny incisions, about ¼ inch long, not even requiring stitches. Other things can happen in the spine that cause stenosis either in the central canal, or in the openings between the bones, called foramina, where large nerves leave and enter the spinal column. One common problem is enlargement of the facet joints. The facets are like little wings that stick up and down from the outside of every vertebra in the spine, connecting with the facets on the vertebrae above and below to form joints on both sides that stabilize the spine, while allowing bending and twisting movements. Like other joints in the body, the facet joints can get damaged and arthritic. When this happens, the bones of the facet joints can start to get larger, like the large knuckles in an arthritic hand. When the bones get larger, they can start to reduce the space in the foramina, causing another type of lumbar spinal stenosis. Another common problem is degeneration of pillow-like disks between the vertebrae. The disks get flatter, like an old pillow. This also reduces the foraminal space between the vertebrae, causing stenosis. 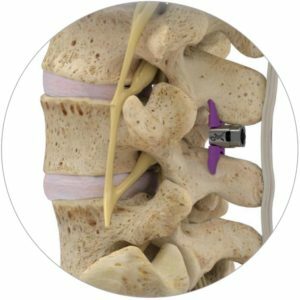 With a Superion® implant, the physician places a small titanium device between the spinous processes (the bony protrusions on each vertebra that you can feel as the bumps along the spine) to hold the vertebrae apart, keeping the foraminal space open, allowing the nerve to function more normally, and reducing pain. Again, this is done through a small incision, about ½ inch long, closed with a couple of stitches. Both procedures take about an hour and are done under moderate sedation and local anesthetic, so can be safely performed in people who can’t have back surgery because they can’t have general anesthesia. There is no need for a hospital stay, so you will go home the same day. Both procedures do require stopping Coumadin or other anti-coagulant medications. Often people report improvement in symptoms immediately, but it may take a few weeks or months to see the full effect. The risk of complications is very low, when done by a skilled physician, like the physicians at North Shore Pain Management. Any surgical procedure, no matter how minor, does carry the risk of infection and bleeding, but the chance of these complications occurring is extraordinarily low with these procedures. Right now, these procedures are covered only for people over age 65 with Medicare who meet specific criteria based on symptoms, history, and imaging, including X-rays and MRIs or CT scans. Provided the criteria are met, both procedures are good options for patients who are not surgical candidates, or who prefer to avoid a more extensive surgical procedure. Neither procedure precludes lumbar spine surgery in the future, but these procedures may make it possible to delay or avoid more extensive surgery. Both procedures were recently approved in the United States. Superion® has been used in Europe since 2007. North Shore Pain Management is currently the only practice in Massachusetts and is one of only two practices in New England with physicians trained and experienced in both of these procedures. Our providers can determine if you would benefit and are a candidate for one of these effective procedures, or if you would do better with another therapy for lumbar spinal stenosis.